Have you ever wondered why it feels good to give and help others out or if there are actual measurable benefits for the giver as well as the receiver? Do we lose true altruism if all parties benefit? Want to feel better? Live longer? Dodge a bad mood? Lift yourself up? It’s easy. Go help someone else! “Helper’s high” has been well documented in numerous studies. For those into evidence-based medicine, check a few abstracts. 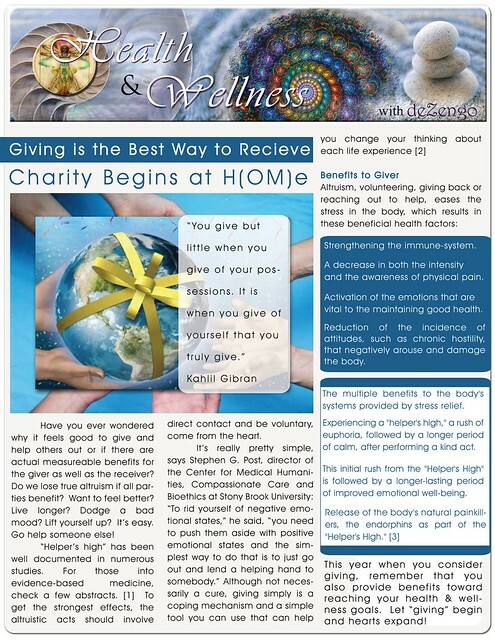 http://www.sciencedaily.com/releases/2010/03/100308151049.htm To get the strongest effects, the altruistic acts should involve direct contact and be voluntary, come from the heart. - A decrease in both the intensity and the awareness of physical pain. - Activation of the emotions that are vital to the maintaining good health. -Reduction of the incidence of attitudes, such as chronic hostility, that negatively arouse and damage the body. The multiple benefits to the body's systems provided by stress relief. - Experiencing a "helper's high," a rush of euphoria, followed by a longer period of calm, after performing a kind act. - This initial rush from the "Helper's High" is followed by a longer-lasting period of improved emotional well-being. This year when you consider giving, remember that you also provide benefits toward reaching your health & wellness goals. Let “giving” begin and hearts expand!